One of the easiest and least expensive ways to completely transform a baby nursery is to give it a coat of paint. Choose your colors, slap it on and voila your baby room is halfway there! First up, you'll need some paint! Find out how to choose and where to buy the best and safest baby nursery paint in the most fabulous colors! Next you need to think about your nursery colors. Will you use one color or a mixture? If you decide to use more than one color you need to decide how much of each color to use and which parts of the nursery room to paint in which colors. Find out how to choose your baby nursery colors and how to incorporate your nursery colors into your nursery design. 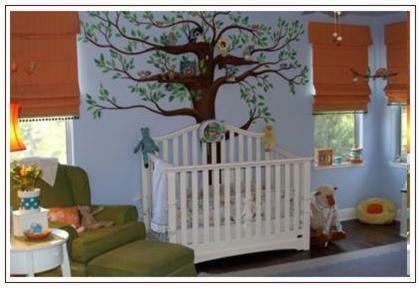 Before you start painting, decide what part of the baby nursery you will be painting. While newly painted walls will take you a long way towards a beautiful baby room, a beautifully painted door or ceiling can add the perfect finishing touch. How To Paint a Room Ceiling. How To Paint Nursery Doors. Painting a border around your baby nursery room is a wonderful way to add your personal touch. It's easy to do and it doesn't take as long as hand painting a whole wall. How To Paint a Nursery Border. A Gallery Of Nursery Wall Border Ideas. Get lots of ideas for using nursery wall borders in your nursery decorating. Everything from hand painted baby room borders to chair rails. If you're feeling adventurous why not try your hand at your own nursery mural. It's not as difficult as you think and it will turn your baby's nursery into a virtual wonderland! Deciding Where To paint Your Baby Room Mural. How To Paint a Room with Nursery Murals. Another easy but very effective way to add fun and depth to your painted nursery walls is to use paint effects. These are particularly popular in modern baby nurseries and there is a wide variety to choose from. Some are easier than others but they all produce a very rewarding final effect. How To Paint Stripes, Blocks and Diamonds. Pictures of Baby Nursery Rooms with Stripes and Blocks. 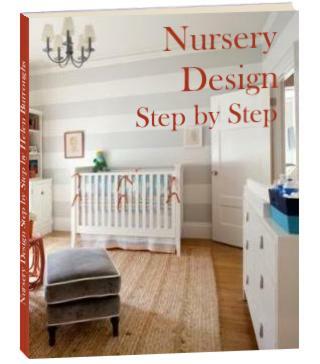 On this page you'll find loads of pictures of striped nurseries to give you some inspiring nursery decorating ideas. How To Paint a Wall with Circles and Polka Dots. Nursery Design Ideas with Polka Dots and Circles. If you want to create a baby nursery using circles or polka dots you'll find plenty of ideas and nursery pictures here. Painting a message on your baby's nursery wall adds a gorgeous, personal touch to your little one's room. Choose a message that comes from your heart and expresses your love for your precious butterball. Ideas For Nursery Wall Messages. If freehand painting is a bit too daunting don't give up - you can always try your hand at stenciling. Stencils can be used to write a message, create a border or even pull together an entire nursery mural! Similar to stenciling, stamping requires a slightly different technique and is especially effective for creating a border or a small focal area in your nursery. Stamping can also be used to create an entire accent wall - and it's so easy to do! How to paint a room for your baby is a work in progress - Please check back often for added pages or subscribe to my baby nursery blog to be instantly notified of all site updates.